If Walt Disney World guests love the Monorail system so much, why hasn’t it been expanded in more than 30 years, despite the construction of two additional theme parks and more than a dozen new resorts? The reason is financial, but the numbers aren’t what you might have heard. The figure of a million dollars per mile keeps coming up in Internet discussions about expanding the Walt Disney World Monorail system. Someone will post that it would certainly be nice if Walt Disney World would replace the stinky diesel bus fleet with sleek “highway in the sky” Monorail lines. Then, someone will reply that they heard that the cost would be a hefty million dollars per mile, and thats just prohibitive. Make sure you get on the correct Monorail. Actually, if The Walt Disney Company could add ten miles to the Monorail system for just $10 million, it would undoubtedly jump at the opportunity. The truth is that the cost would be much, much higher. The Las Vegas Monorail, which opened in 2004, cost $654 million for just 4.4 miles—almost $150 million per mile. It uses the same Bombardier technology as the Walt Disney World Monorail. Bombardier acquired the technology from Disney. In fact, before the full Las Vegas system was built, the first two monorail trains in Las Vegas were retired Walt Disney World Mark IV trains. There were some issues in Las Vegas—such as having to deal with numerous property owners, structures in the right-of-way, and municipal politics—which Disney would not face. São Paulo, Brazil is getting a 27-km (16-mile) Bombardier INNOVIA Monorail 300 system for $800 million. That’s $50 million per mile. The automated system includes 17 stations and 54 seven-car trains (a total of 378 cars). The beams are slightly larger than the beams at Walt Disney World. The trains allow riders to walk between cars, unlike Disney’s. The Brazil numbers provide a more up-to-date metric than the Las Vegas numbers, although construction costs in Brazil are undoubtedly different from those in the United States. $50 million per mile is much lower than $150 million per mile for Las Vegas—but still far higher than $1 million per mile. The Walt Disney World Monorail system does not generate direct revenue, but Monorail resorts seems to command the highest rooms rates at Walt Disney World. For guests, the Monorails add to the “magic” of a Disney vacation. An expanded Monorail system could reduce bus fleet expenses (although the trains are not as flexible as buses). However, a Monorail expansion would be a huge capital expense. 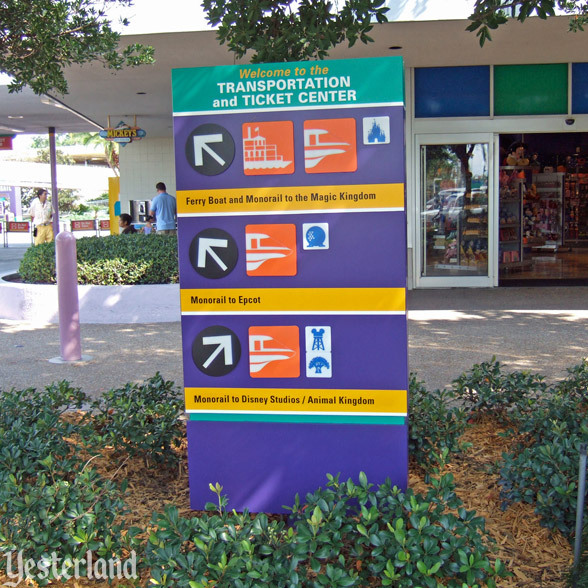 The system has not been extended since the opening of the Epcot line in 1982. Presumably, Disney Parks & Resorts management has been unable to come up with a business case to justify the spending. Even if Disney could hold the costs below São Paulo’s $50 million per mile, it’s safe to say that the reason is cost—a much higher cost than the oft-repeated million dollars per mile. This is the third of three Monorail stories today. Click Here to circle back to the first one. “Photoshopped” image of TTC directional sign: 2008 by Werner Weiss, based on 2007 photo by Allen Huffman. 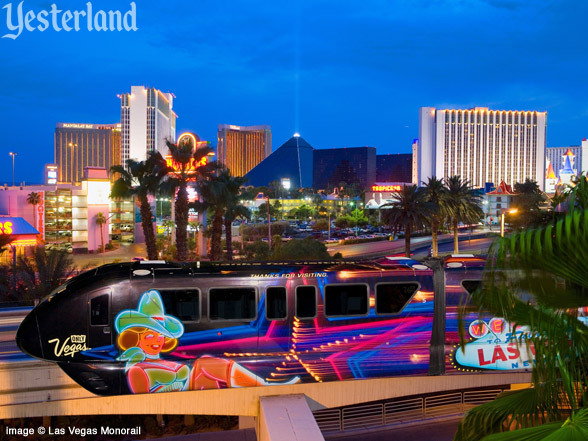 Photo of Monorail with Las Vegas resorts in the background © Las Vegas Monorail. 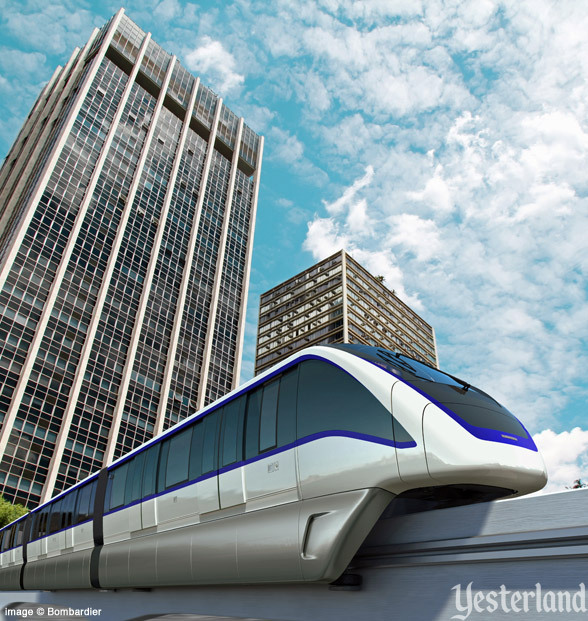 Rendering of Bombardier INNOVIA Monorail 300 © Bombardier. 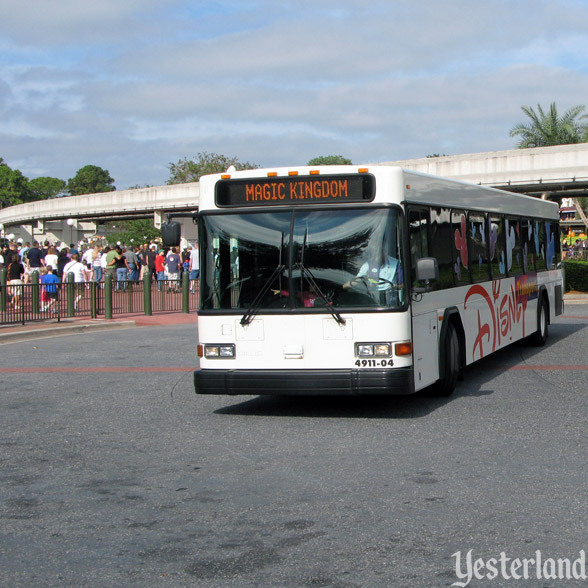 Photo of Magic Kingdom bus: Werner Weiss, 2009.